Can you believe that it’s July already?! 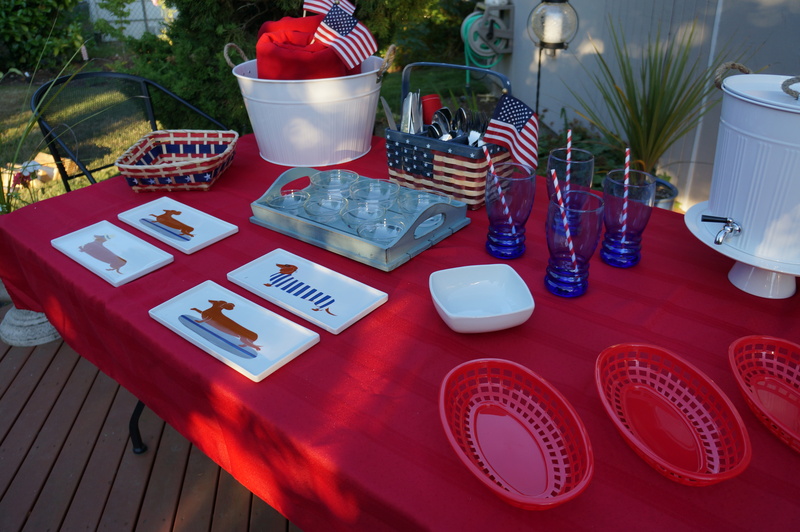 The terrific folks over at West Elm Seattle have provided me with some great items to dress up my patriotic table for this upcoming weekend’s festivities. 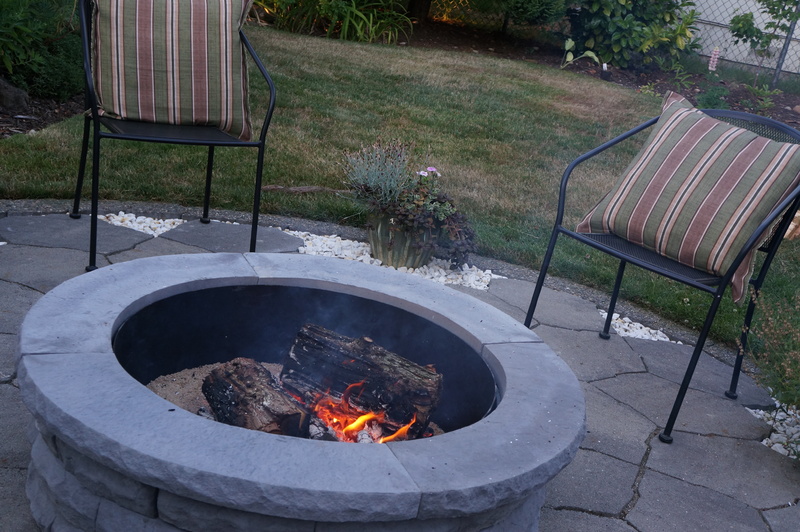 So as a preview to the long holiday coming up, we took advantage of the beautiful weather this past weekend to break in our brand new built-in firepit. 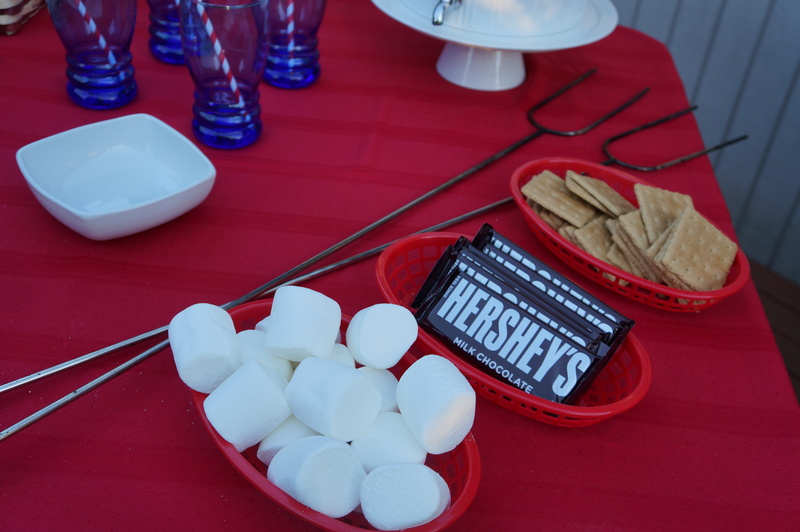 With a hot dog and smores feast! 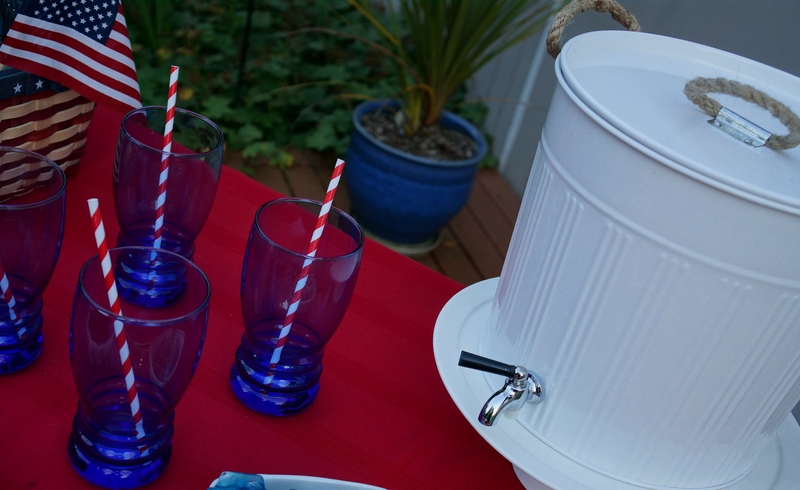 This Outdoor Metal Drink Dispenser, with rope handles, is a classy looking way to serve your outdoor beverages. I love the removable lid. It makes it so easy to refill – because when you have a crowd, you don’t want to have to fuss. On my summer bucket list this year? Learning to make my own lemonade! I can see I will get ALOT of use out of this dispenser! 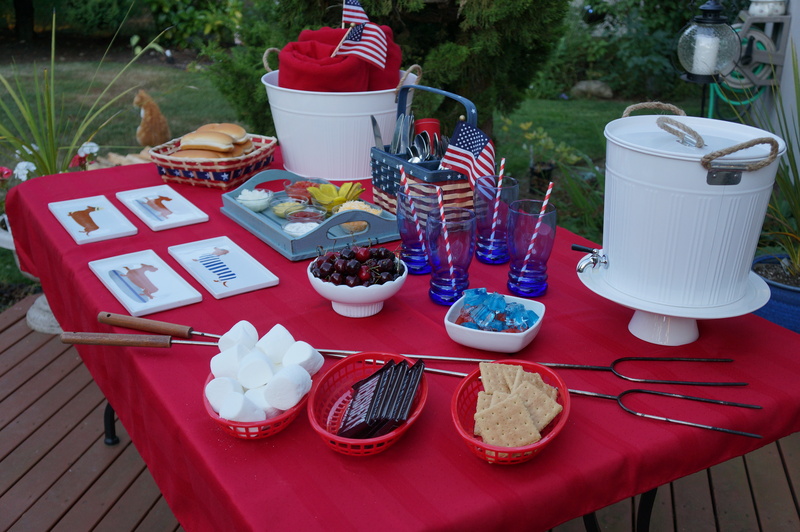 When the weather chills off in the evening (or if you live in the Pacific Northwest where we tend to have trouble lighting our soggy sparklers!) a few blankets provided for your guests are always welcome. This Outdoor Metal Drink Bucket (good for icing drinks as well, of course) is perfect for holding a couple of cozy coverups! 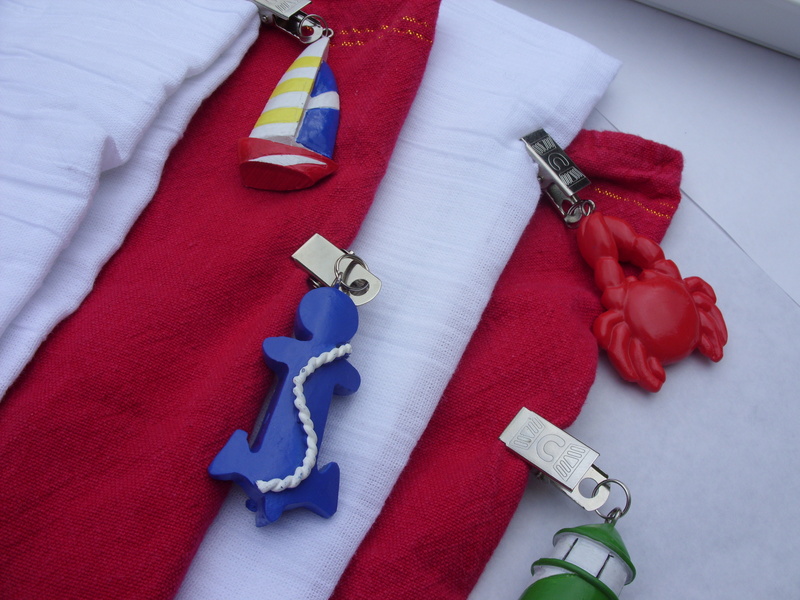 It would be great for towels too if you are hosting a pool party. 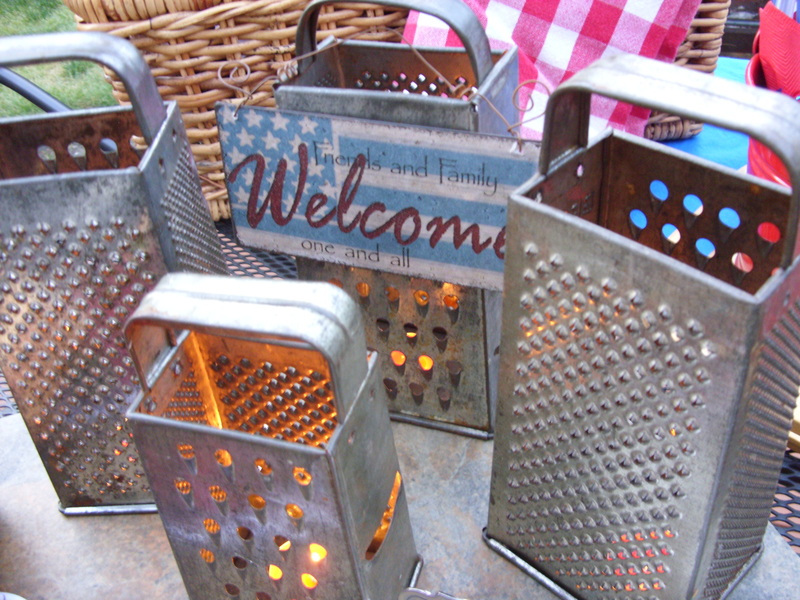 To keep those messy hands clean at your BBQ, instead of paper napkins, why not go a bit more classy? 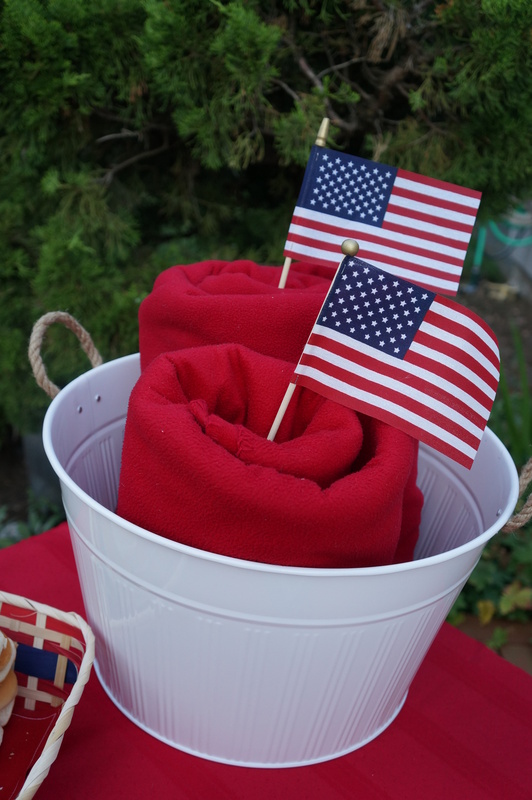 Cloth napkins dress things up but, when you are feeding a crowd, you may not have enough to go around – these cloth napkins on a roll are ingenious for summer gatherings! 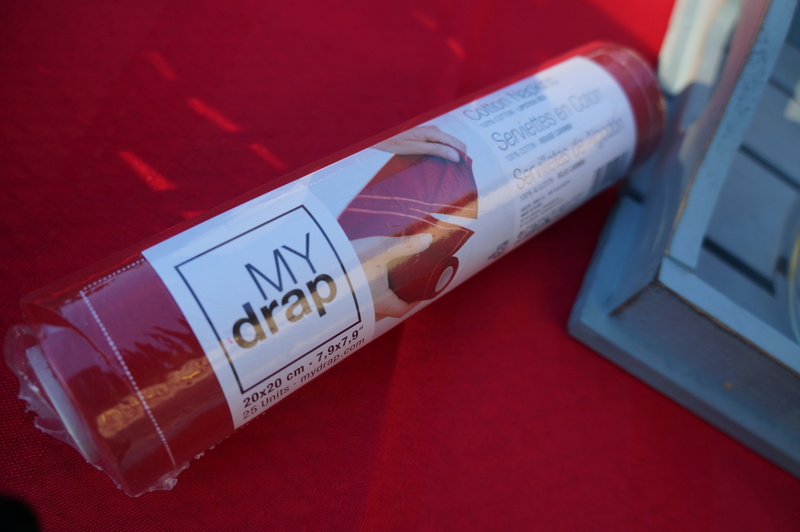 My Drap tear-off napkins are washable and re-usable. Think upscale paper towels! Love these! 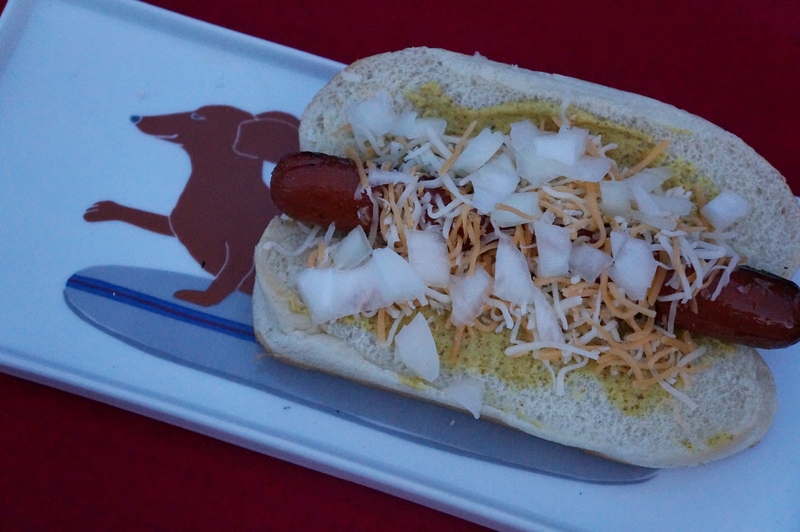 What is more iconic for the all-American holiday than the mighty dog? 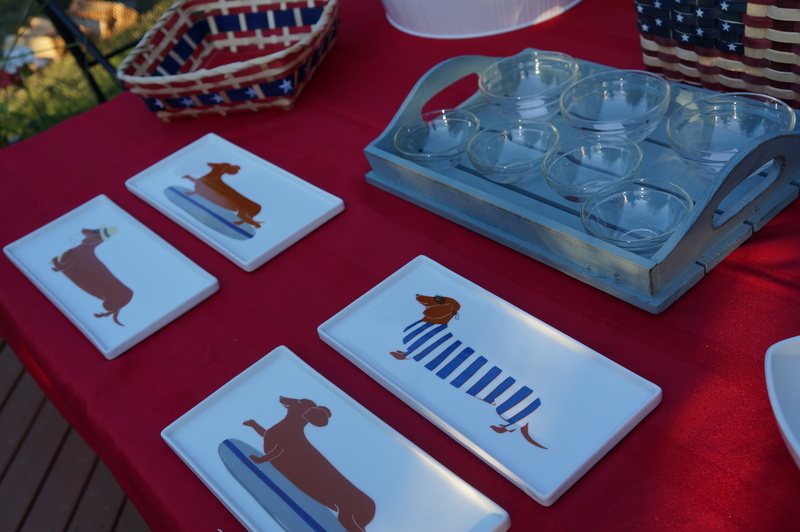 And these fun Claudia Pearson Dog Plates from West Elm are a fun way to add some whimsy to your hot dog cookout! 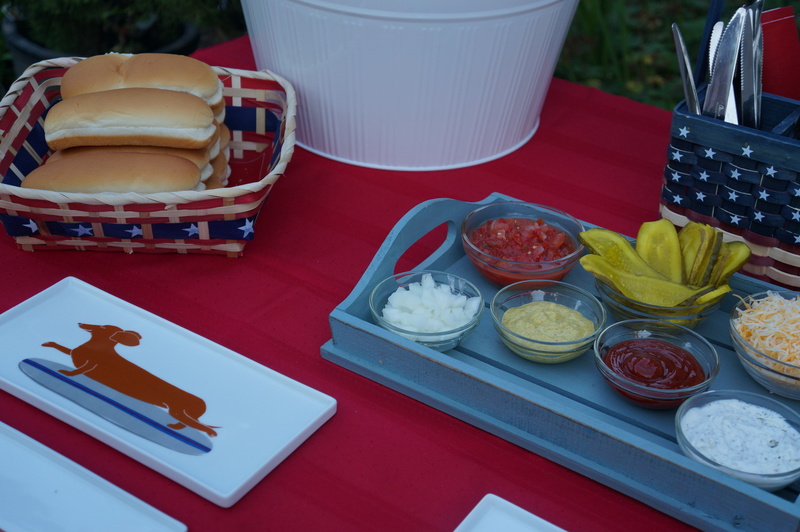 A hot dog topping bar is a great way to elevate the ordinary hot dog, and to make sure that even your pickiest eater gets what they want! Everyone can customize their own dinner! Mustard – Dijon and deli mustard are a great start but there are so many great varieties out there. Homey mustard, spicy, brown, stone ground, German – even beer mustard! Ketchup – there are also many different recipes for making your own ketchup. Try your hand at making your own flavor. 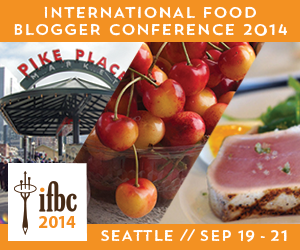 Have you ever heard of rhubarb ketchup? Delicious! Cheese – You can put out traditional sliced cheddar, but also try shredded mexican, crumbled blue cheese, cream cheese mixed with fresh chopped herbs – the sky’s the limit! Pickles – I used sliced pickles (these sandwich stackers fit perfectly in a hot dog bun!) but there are so many ways you can go with this, from different types of relish to the pickled vegetable (peppers would be awesome!) of your choice. Onions of course! Red, yellow, sweet – whatever you like! Bacon – we like to make bacon-wrapped hot dogs by wrapping raw bacon around the uncooked hot dog and then grilling it, but along those same lines, you could add a bowl of chopped cooked bacon to your topping bar. Salsa – again, the choices are limitless. A plain pico de gallo is nice but a sweet fresh mango salsa would really kick this party up a notch. Chili – I always serve bean-less chili with my dogs but a chicken or vegetarian chili would be just as tasty. Go spicy! A great hot sauce, Sriracha or even wasabi adds a bang to this holiday fare. What is your favorite hot dog topping? I was not financially compensated for this post. I received samples for review purposes only. The opinions are completely my own based on my experience. Are you throwing a grand New Year’s Eve party this year? Or, are you like us – just staying in all cozy with only the family? 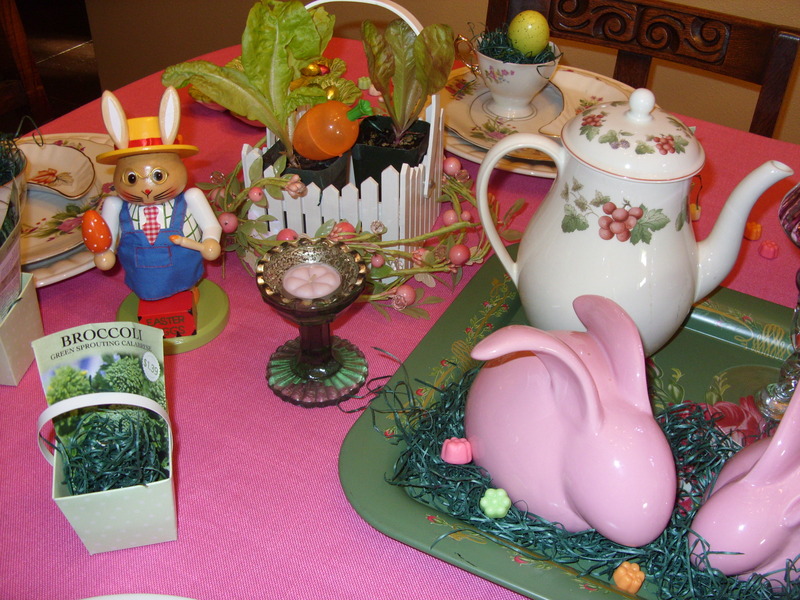 Either way, this truly festive holiday is yet another excuse for you to set a pretty table. This year’s theme for my NYE table is sparkly silver & blue. I am a strong believer in using what I have around the house for entertaining, and then adding items that I find by thrifting or shopping discounts. You will see that theme run through my blog – over and over again. This year when I unpacked the Christmas tree decorations, I pulled out a box of shiny blue glass ornaments that I never seem to be able to put on my tree (they just don’t go with anything else I own) – it had a note I had written on it before packing them away last year. When I received these shiny silvery napkin rings as a gift for Christmas from my Mother-in-law, I knew it was meant to be. But I did shop the Christmas clearance sales yesterday for a few items that just make this table. I started with our chandelier, and decided to hang the blue glass ornaments from it at varying heights with some blue organza ribbon I had on hand. I found this miniature silver Christmas tree and thought it would be perfect on my table! For more sparkle I love lots of candle light! I pulled out my best Champagne glasses (these were my great-grandmothers) and tossed in some party hats and blowers I bought at the dollar store. It’s okay to go easy on yourself (and cut back on your laundry chores) by using paper napkins when entertaining – just buy some really nice, thick ones and then dress them up with napkin rings. I found these Christmas silver swirl paper napkins at the party store on 70% clearance! I simply rolled them, inserted them in the rings and then fanned them out, displaying them on a stack of my plain glass plates. To see more of my inspiration and many other wonderful ideas, check out my Pinterest board chock full of New Year’s Eve visuals. 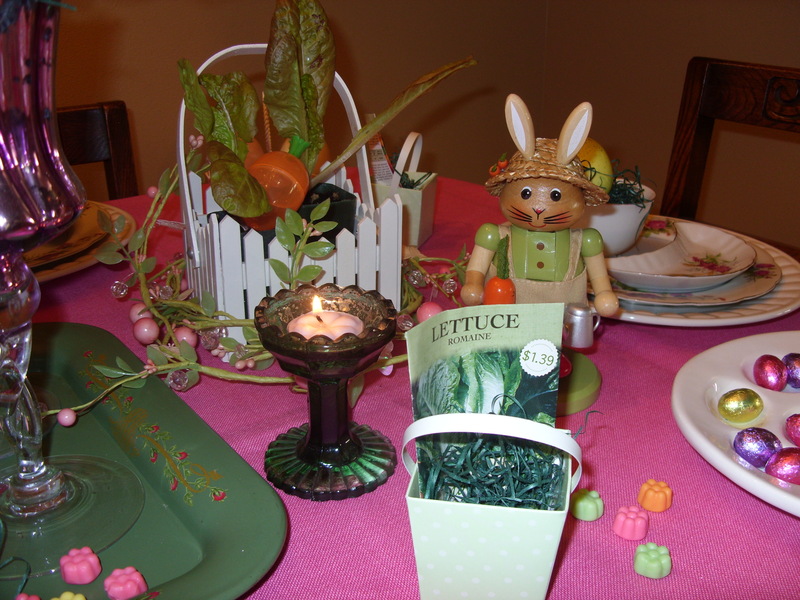 My table is all ready for appetizers! Check out this great list of seafood apps to make from Whole Foods Market or my recipe for easy, fantastic stuffed mushrooms here. A Very Whole Foods 4th! 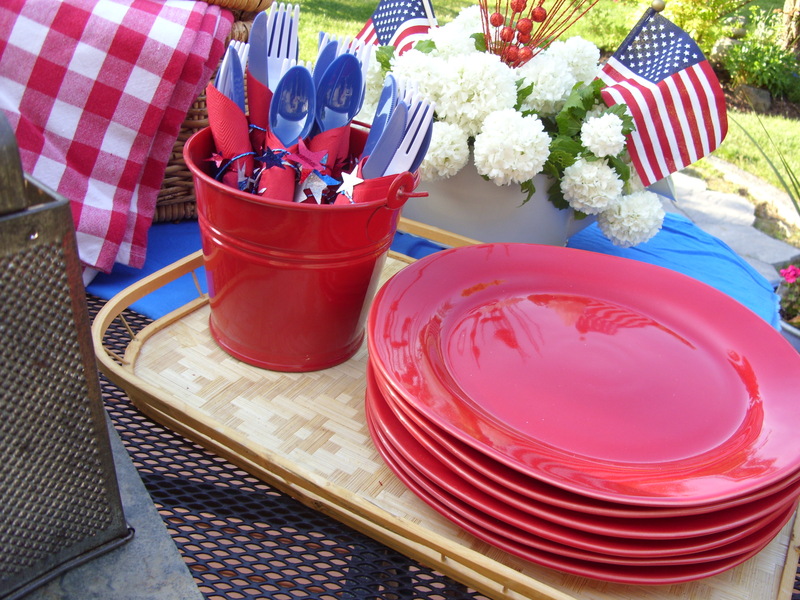 The Fourth of July is next week and many of you may be gearing up for that big holiday cookout! To give you some inspiration, Whole Foods Market Redmond will be hosting a ‘Simply Smokin’ Summer’ event on Wednesday, July 4. The store will be sampling their custom smoked meats – offering up everything from jerky to brisket to pulled pork. 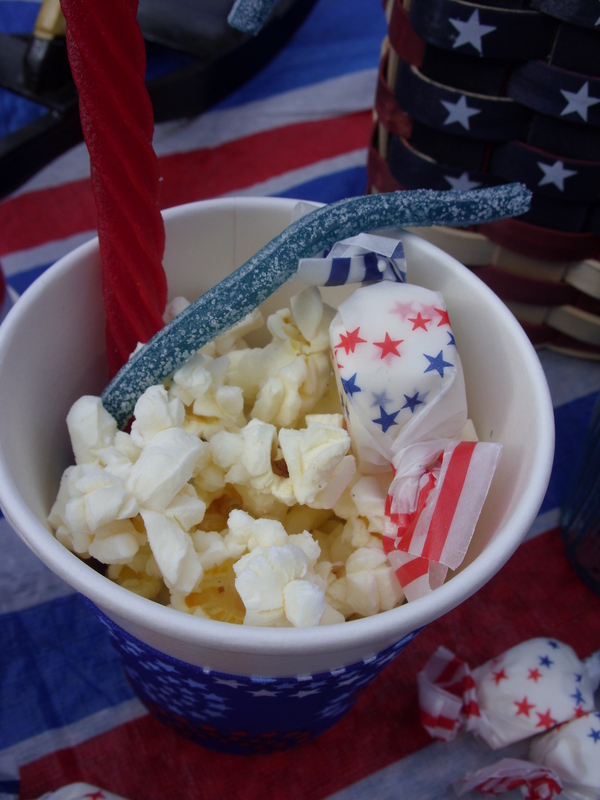 All of the great Fourth of July classics! 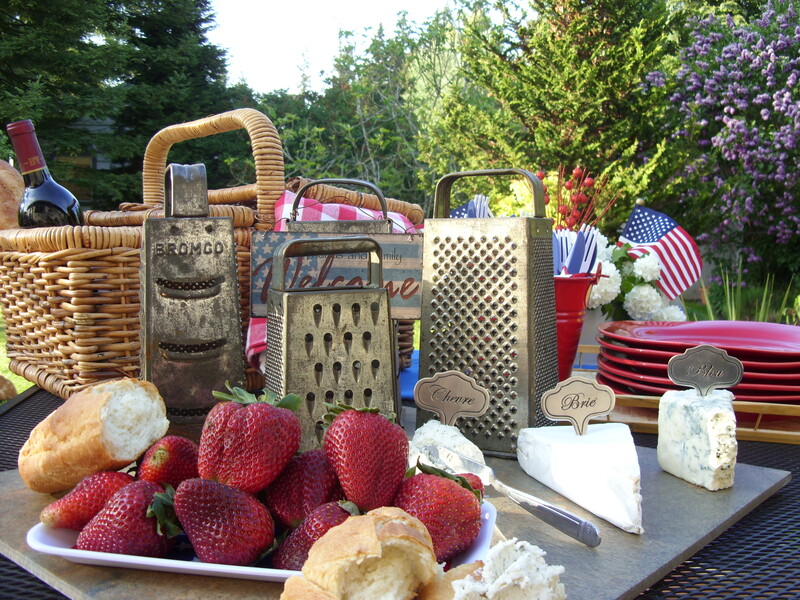 The Fourth of July is all about the grilling! Try something a little bit different with this Grilled Turkey Burger with Gouda. This looks amazing! 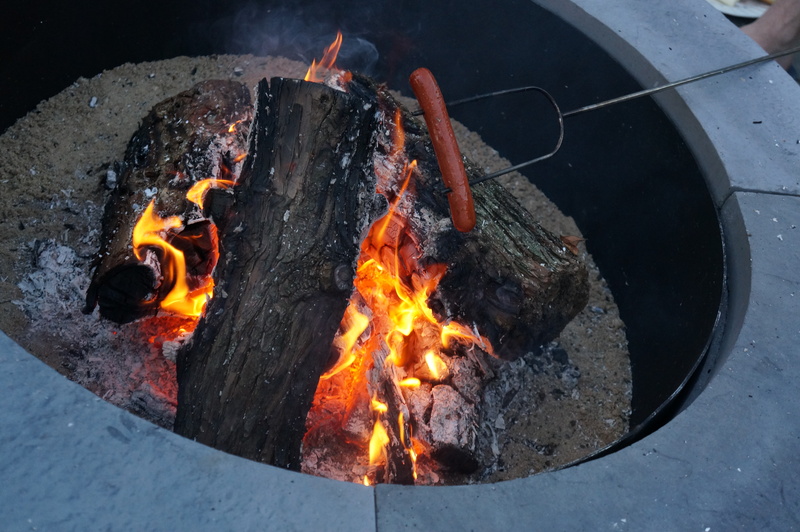 Hamburgers are traditional grilling food but so are hot dogs. Take it up a notch with these – Sausage On a Bun With Pickled Pepper Relish. Here in the PacNW, we love our seafood. Try this Linguine with Grilled Shrimp and Arugula-Parsley Pesto. 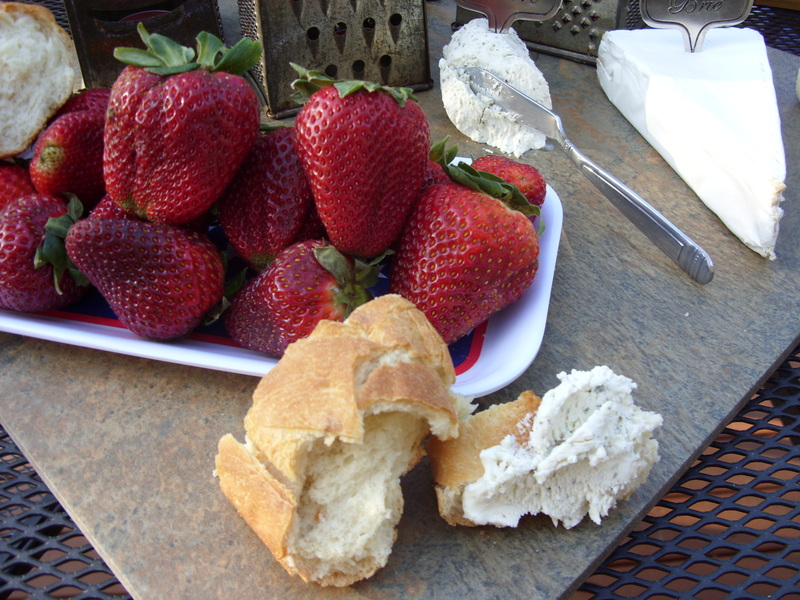 And of course – Dessert! Here’s an Old-Fashioned Peach Cobbler. This dessert is so easy! 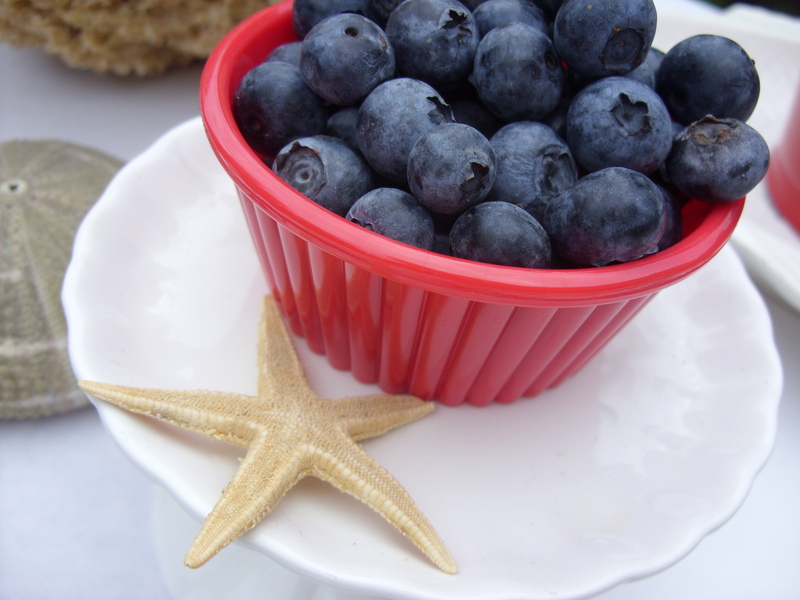 – Red, White and Blue Fruit Salad. Finally, wash it all down with this delish Sangria Cooler. Or, try Mango Agua Fresca for a non-alcoholic option. 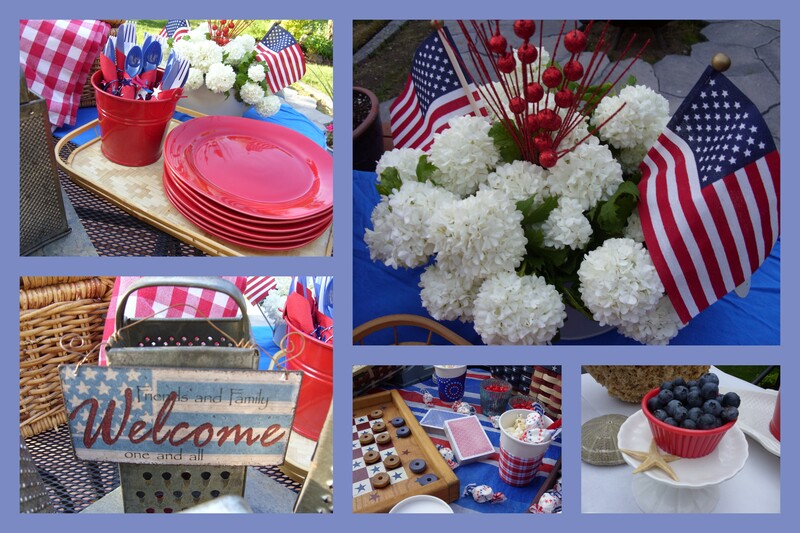 And if you need more recipes or festive table settings ideas for the big holiday, be sure to check out my fun seafood boil or my other recent patriotic posts here! 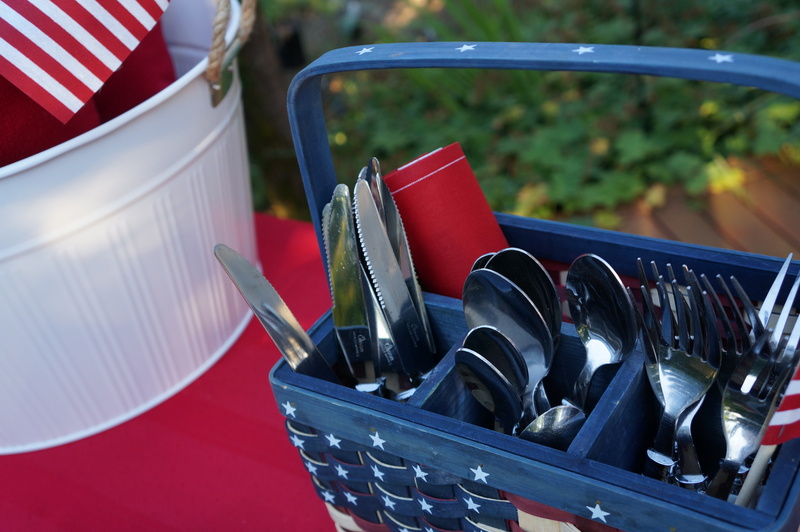 Are those grills ready for next week’s all-American holiday? If you can’t wait for next week to enjoy a good dog, stop by West Elm this Saturday, June 30! West Elm Seattle (2201 Westlake, Seattle, Washington 98121) will be celebrating the 4th of July a little early with their Dog Days of Summer event! The store will be giving out hot dogs from Dante’s Dogs from 12-2pm. LOVE Dante’s! They even have a great vegetarian option. 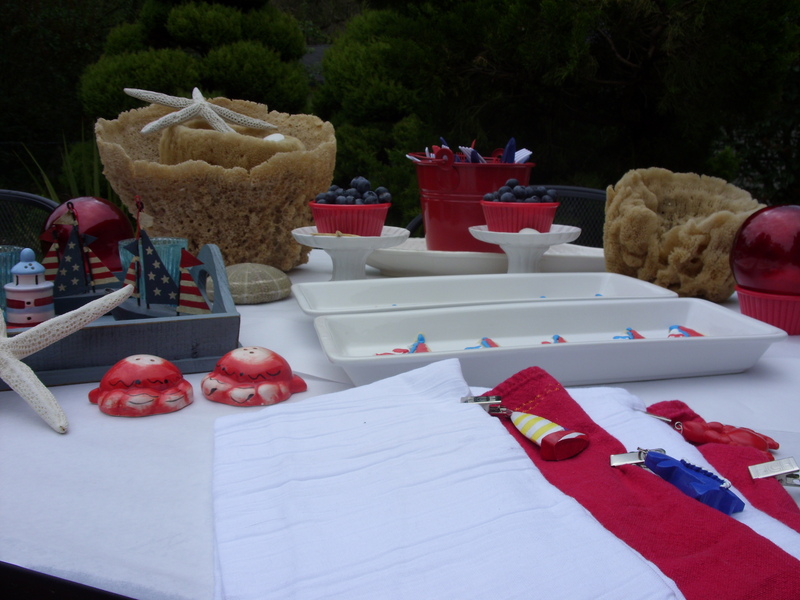 And while you’re there, West Elm has some wonderful pieces that would be perfect for your 4th of July table! 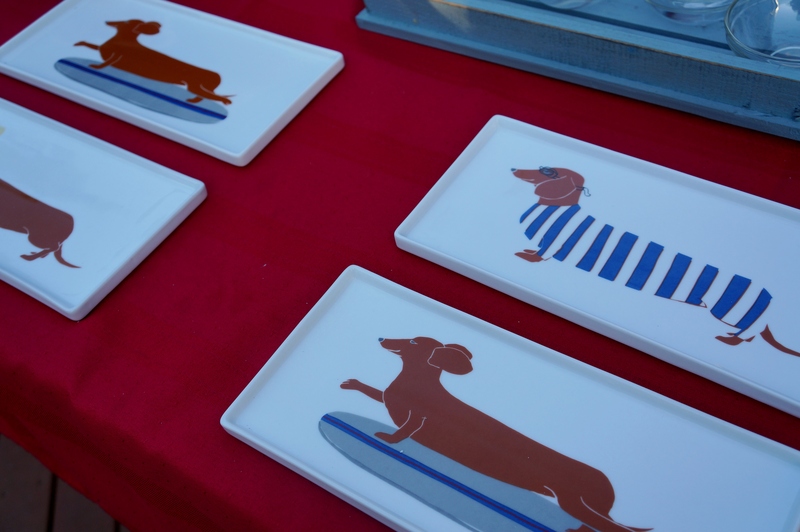 I absolutely love these Claudia Pearson Dog Plates above, illustrated with adorable dachshunds. 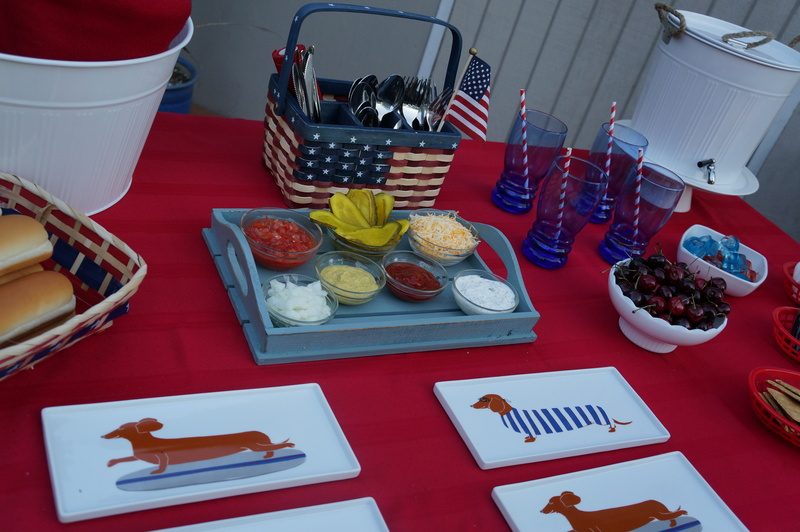 What a fun way to serve hot dogs for your summer party! From the same artist are these Summer Plates. Very patriotic – and on sale! 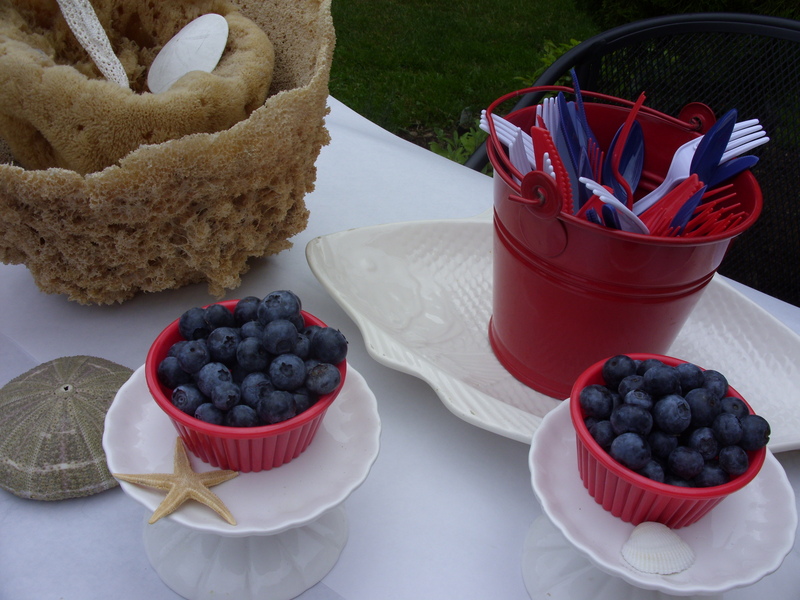 If you remember, I used these adorable red, white and blue plates for my patriotic seafood boil. 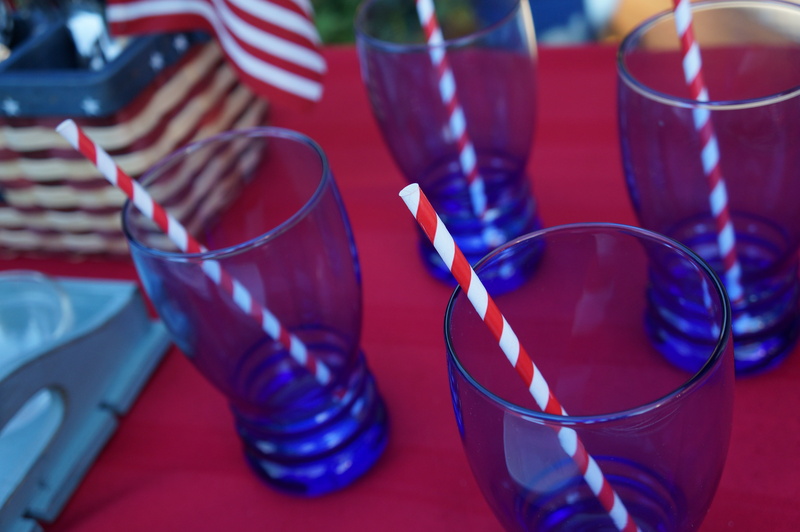 Any of these would work nicely on your 4th table! 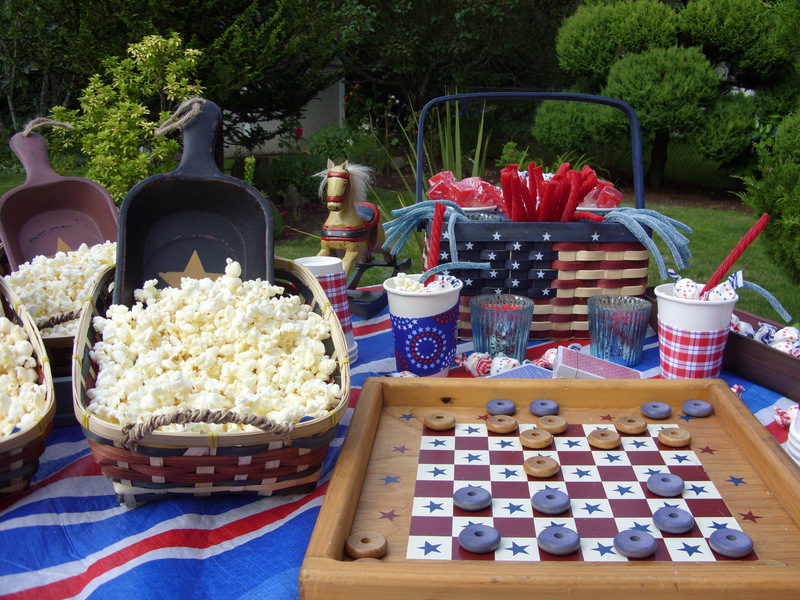 Patriotic Popcorn & Candy Spread – Game time! 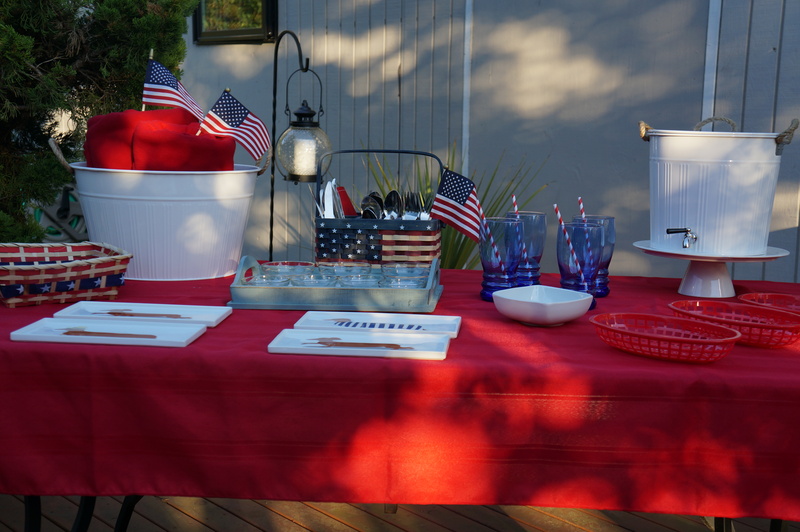 I just realized that I have been on a bit of a patriotic kick on the blog lately. 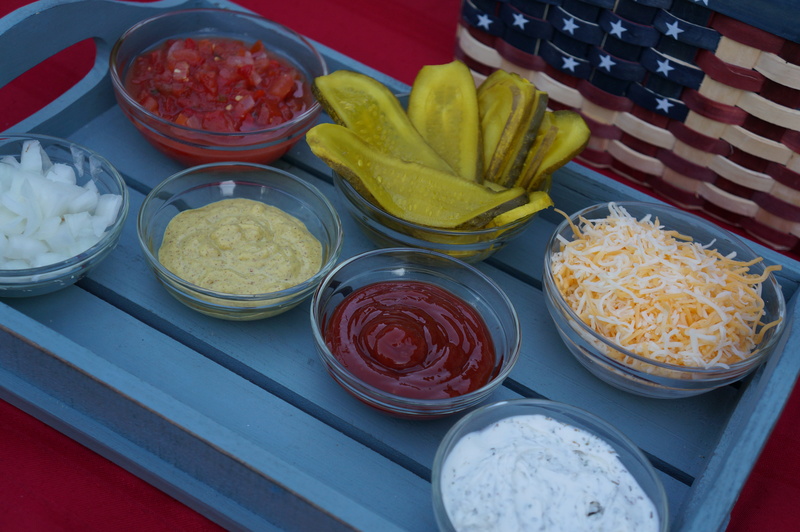 First I showed you this patriotic cheese appetizer spread for Memorial Day, and then I shared this red, white and blue nautical seafood boil dinner for Father’s Day. Both of these would be just perfect for the 4th of July. 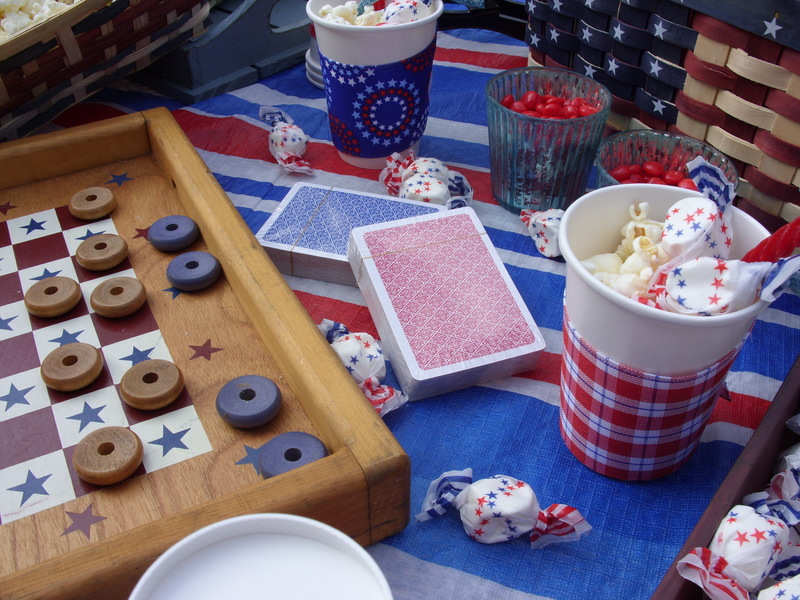 But after the apps and dinner, and before the evening’s festivities, there is that opportunity for some quiet time where you can just be chill with friends and family – relaxing, visiting and maybe play a few board games while waiting for the big fireworks show. 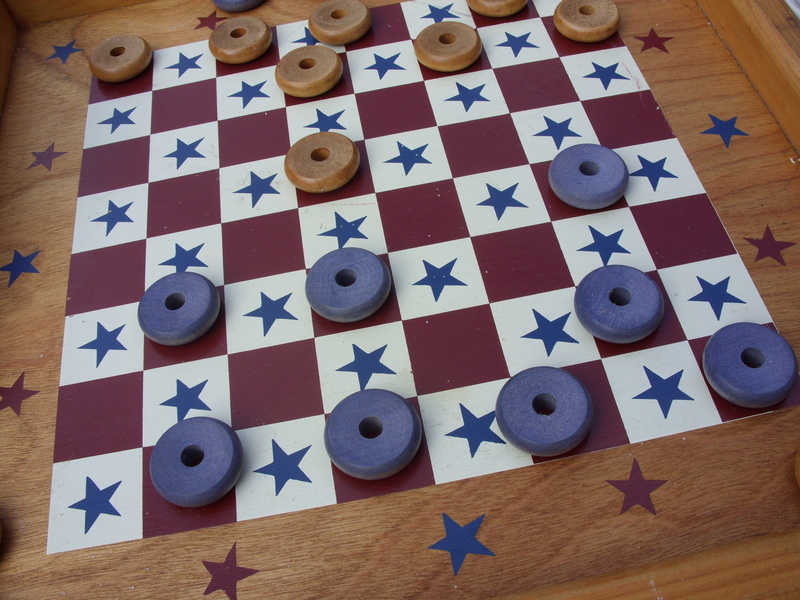 The idea for this post was inspired by this vintage-looking, Americana-style checkers board I found on my latest flea marketing trip – Groovy Girlfriends you did it again! 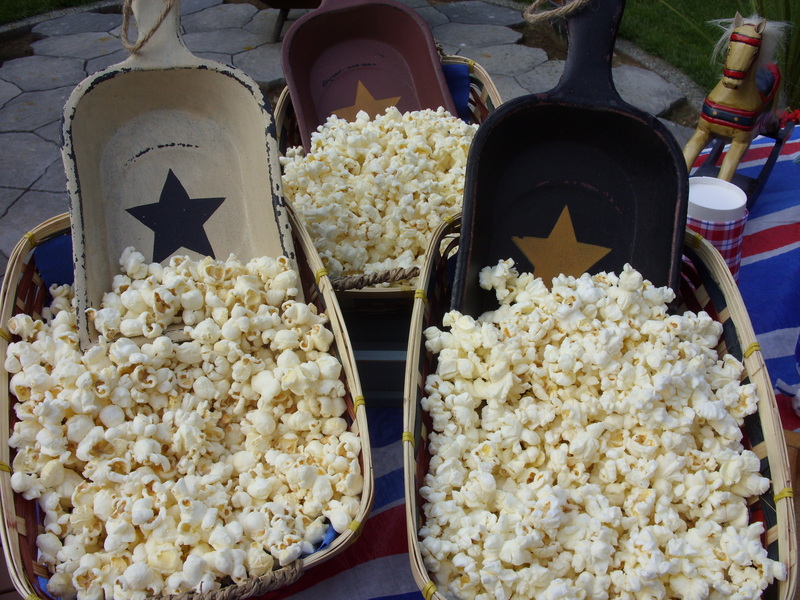 Serve up different kinds of popcorn – here I used plain (with butter, of course! 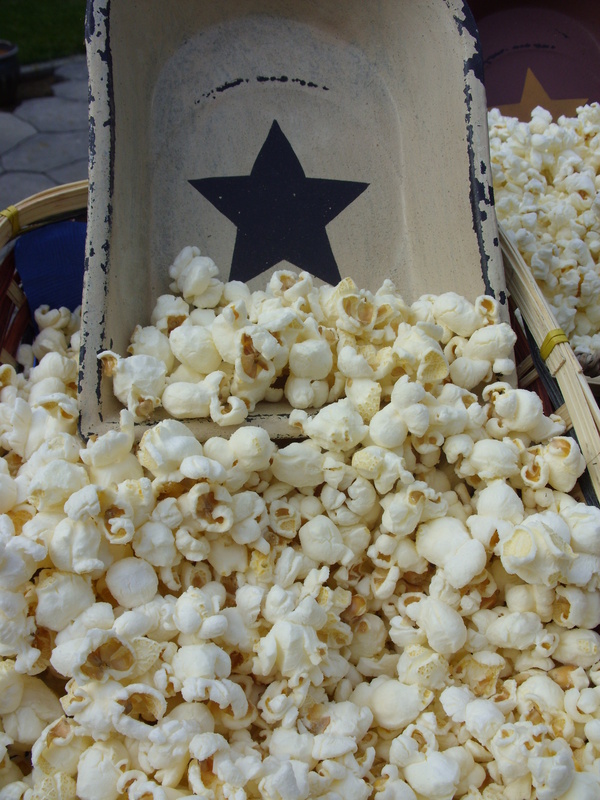 ), kettle corn and white cheddar flavors. 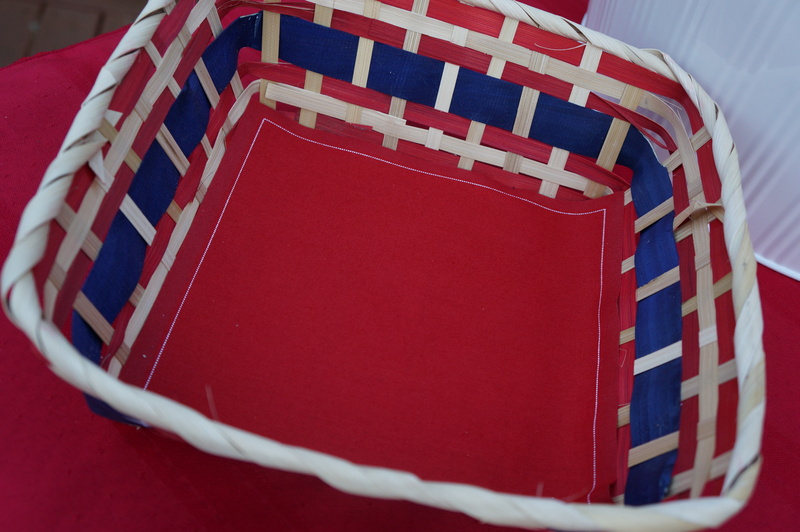 I found these patriotic-striped baskets at the dollar store and just lined them with a paper napkin – though cloth would work great as well! 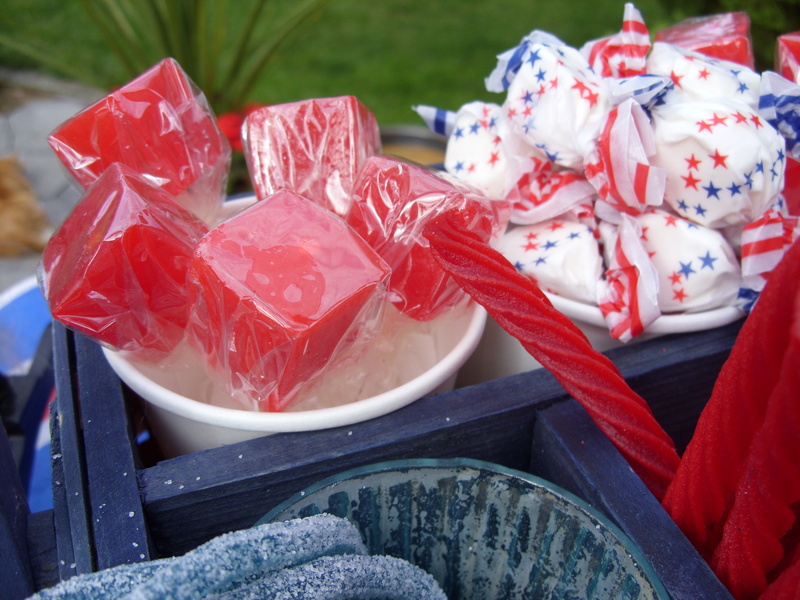 Then I stocked up on all the red, white and blue candies I could find that had an old-fashioned feel to them. 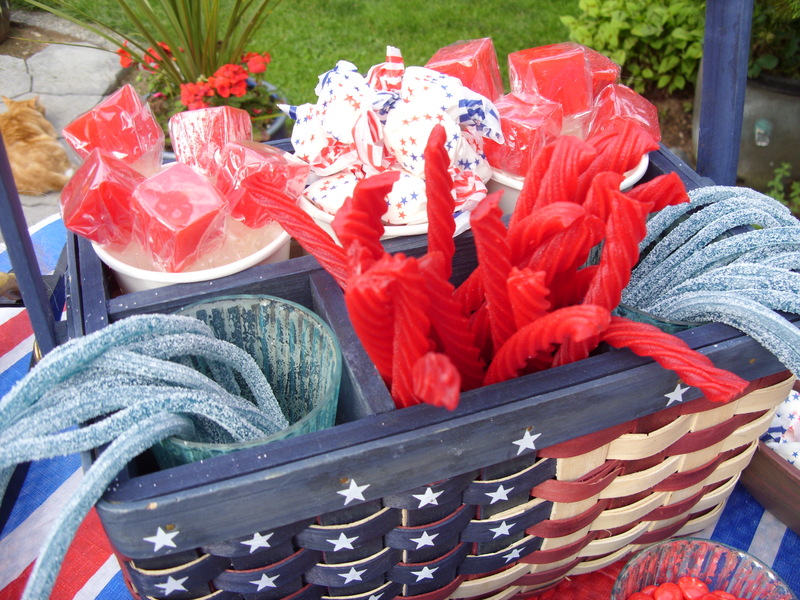 I think this picnic silverware basket was a fun choice for holding all my candy finds! 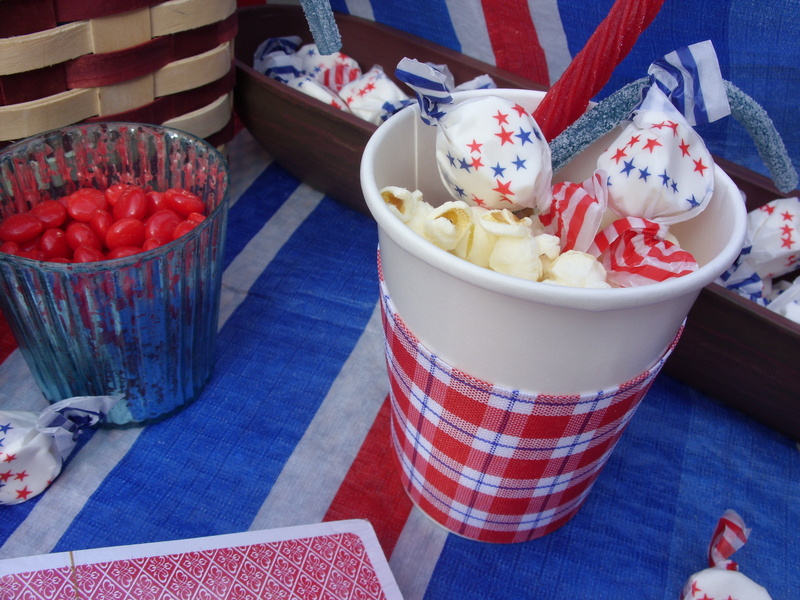 And I just love that I was able to score these patriotic taffies! I just happened upon them at the grocery store. Peppermint is my all-time favorite! 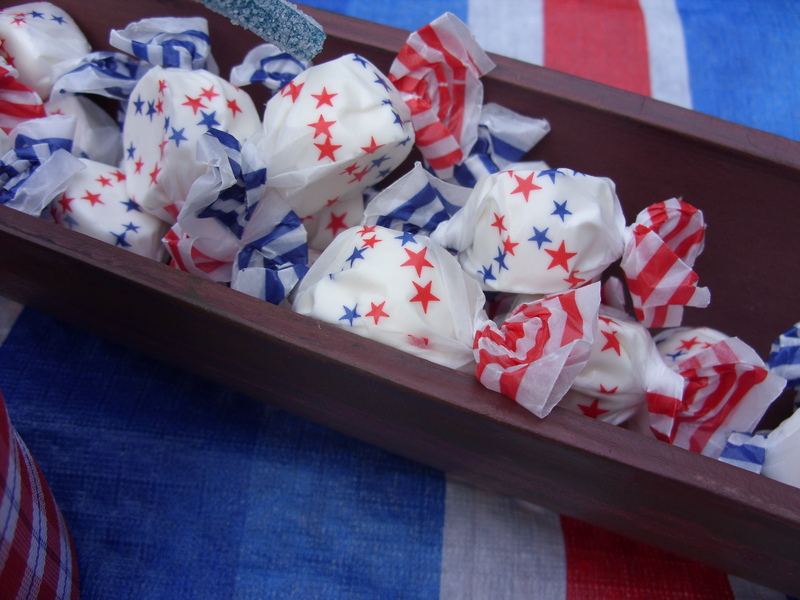 And how much more summer-time can you get than saltwater taffy? To serve the snacks in? Simple! 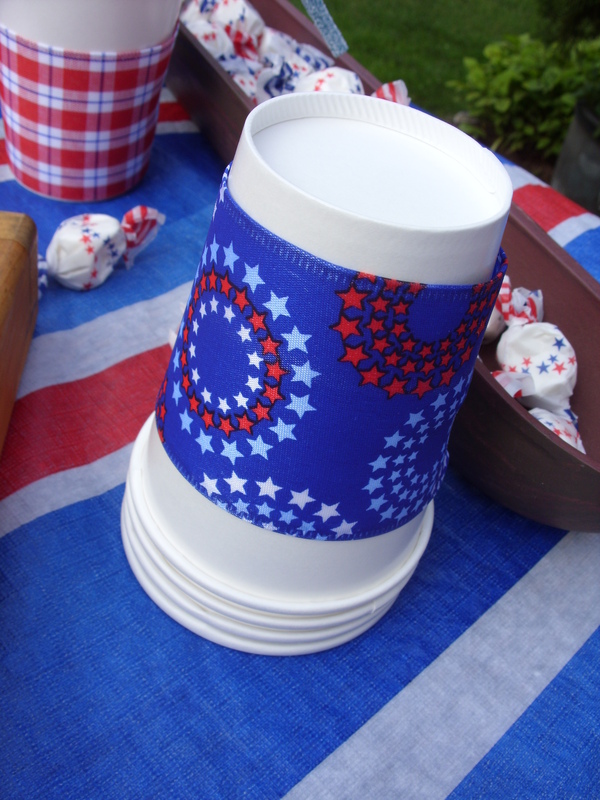 Use store-bought, plain, white paper cups trimmed out with a length of colorful ribbon. What is your favorite way to grab some quiet time on a long holiday? Father’s Day is coming up this weekend, and while my husband hasn’t shared with me yet what he would like to do for his special day, we do have somewhat of a tradition (the last two years!) of having a Seafood Boil on my husband’s birthday and Father’s Day. 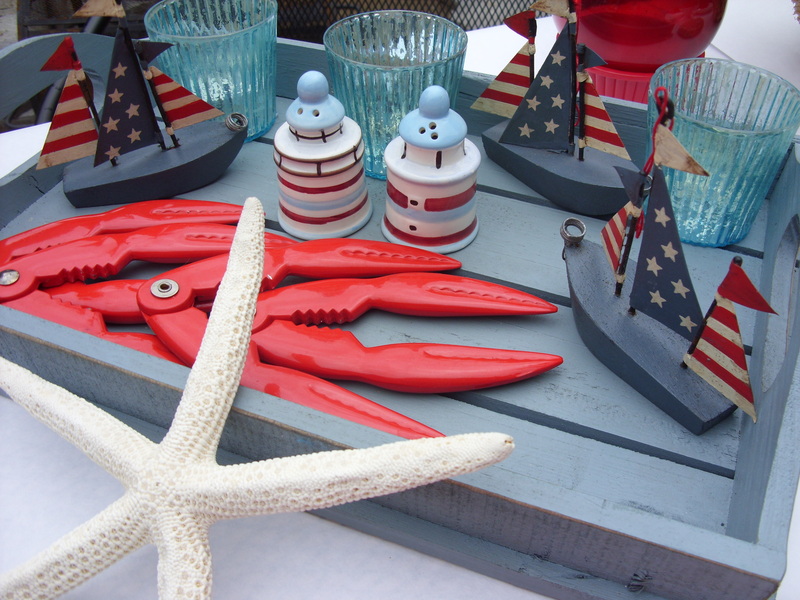 This nautical table setting that I have created would go perfectly with the Scrumptious Seafood Boil that I blogged about here. It’s a great meal to feed a crowd of testosterone-filled seafood lovers – and with a house full of guys, it’s right up our alley! 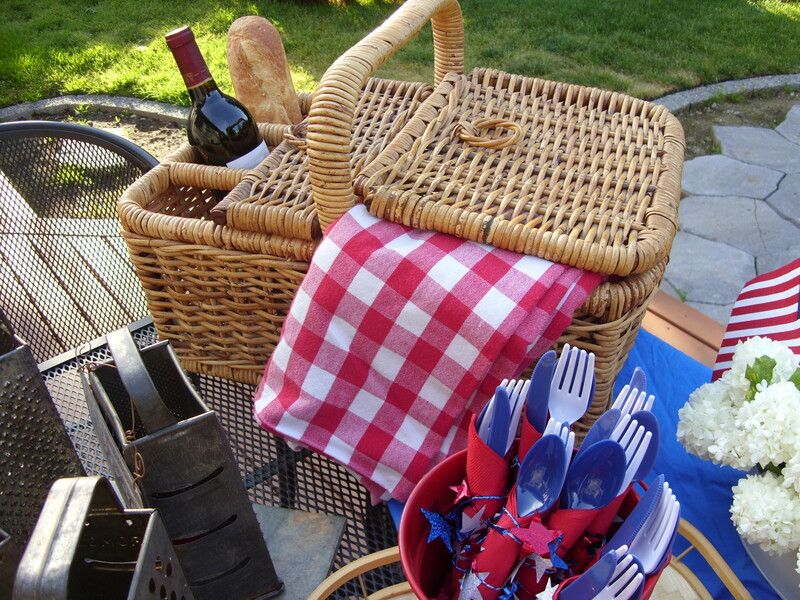 While I styled it for Father’s Day, this party would be fitting for any summer-time outdoor gathering. 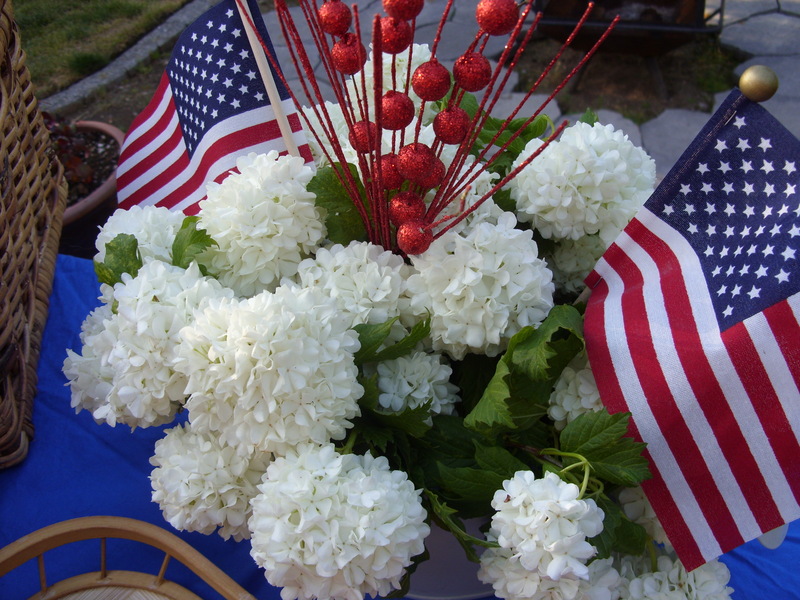 And of course, with the prominent red, white, and blue, it is also suitable for Memorial Day or the 4th of July. 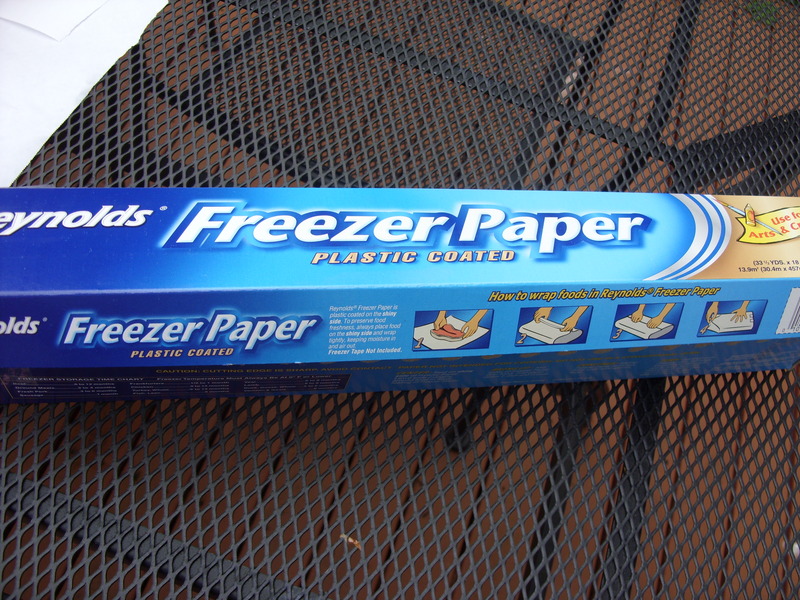 Instead of a tablecloth, it all starts with some butcher paper -I use Reynolds Freezer Paper and just layer it in long pieces lengthwise on the table. You may be able to get some from your butcher or use actual butcher paper. Instead of serving platters for the meal, we just pour the seafood directly out of the pot onto the paper and let everyone grab as they wish. The added bonus in using the paper is that when the meal is over, you can just wrap up all the scraps in it and toss the whole lot in the trash. I’ve tried newspapers in the past but it tends to soak through and fall apart when you bundle up the leftover garbage. The Reynolds has a coated side that prevents this from happening and I really like the crisp, clean look of the white. 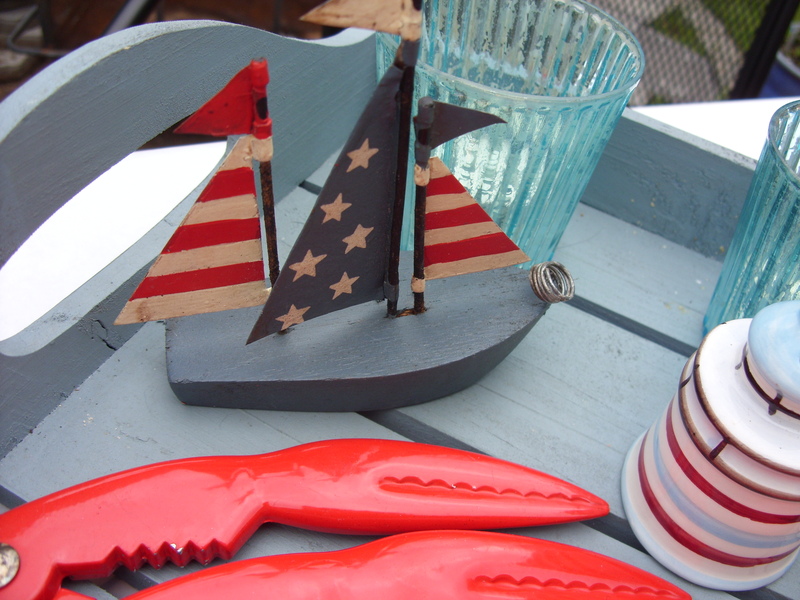 For the table decor, I gathered all my nautical kitchen items and my seaside-related things from around the house. I love these sea sponges I picked up in Tarpon Springs, Florida. (If you are ever on the Gulf Coast, you must visit there! 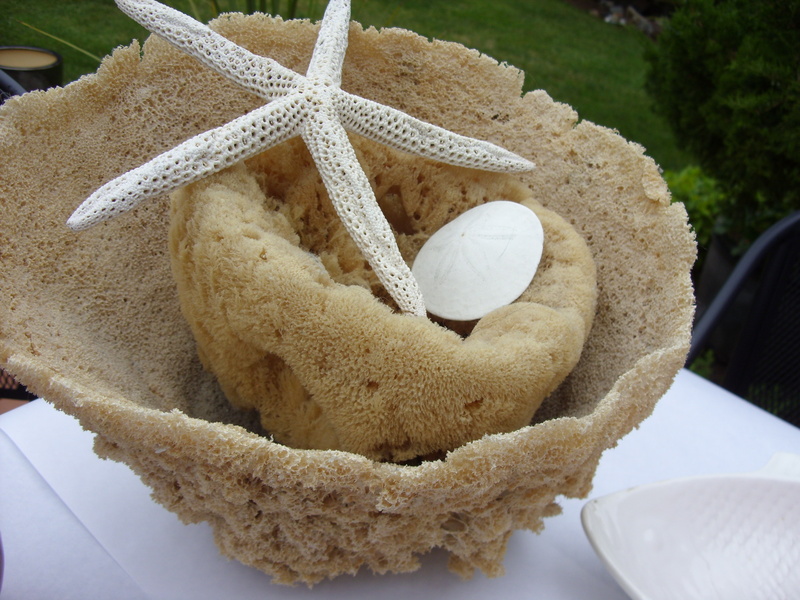 It’s a quaint little seaside town known as the world’s best location for natural sea sponges. And it has the most amazing Greek restaurants!) I am so excited I finally get to use them in a table-scape! 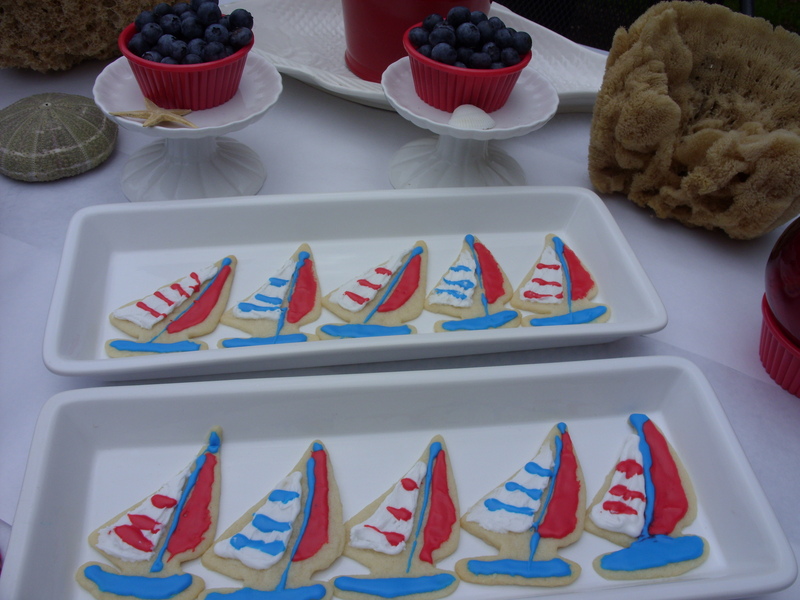 I made some fun sailboat cookies (don’t laugh! I decorated them myself!) and added some individual berry cups for dessert. 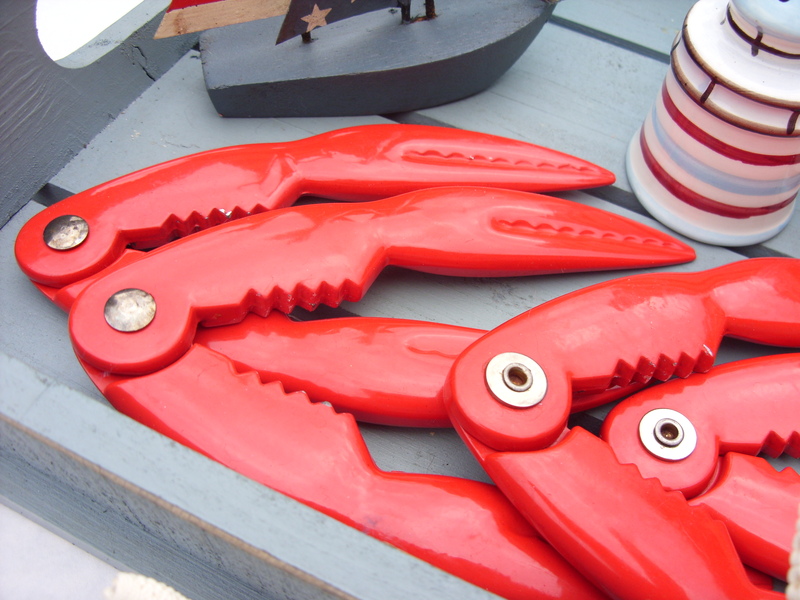 You can’t have a seafood feed without crab crackers! I recently went to a Moroccan restaurant where they gave us smallish, white bath towels to use as napkins – no lie! No bath towels here, but large flour sack dish cloths work great as napkins for this meal. 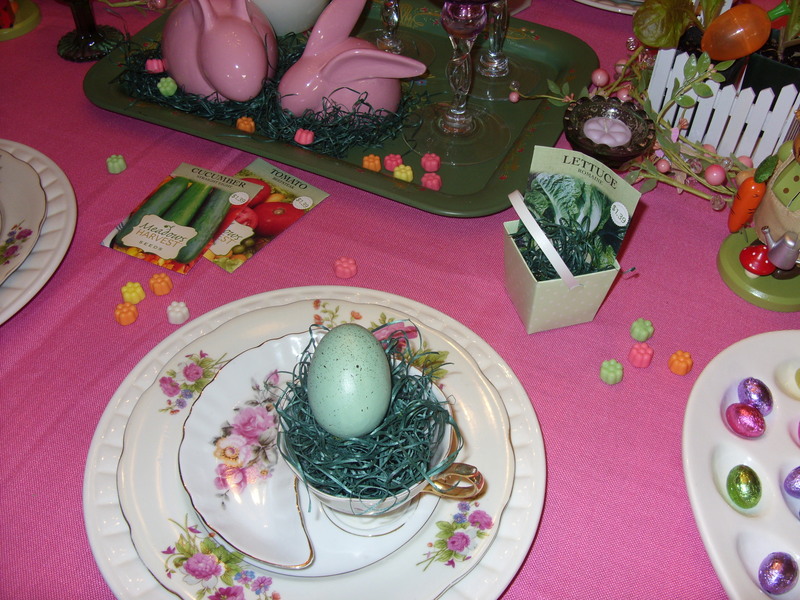 I used my table cloth weights as decoration for the napkins. 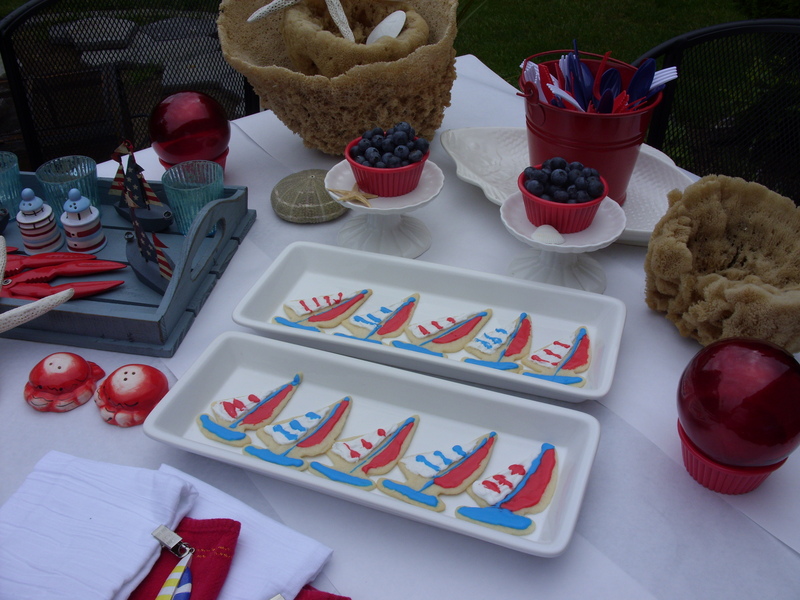 And for your guests to pile up all their goodies, I love these Schooner Melamine Plates from west elm. Plus, they are on sale right now – and free shipping! What are your traditions to recognize all the hard work that dad does to keep his family safe, healthy and happy? 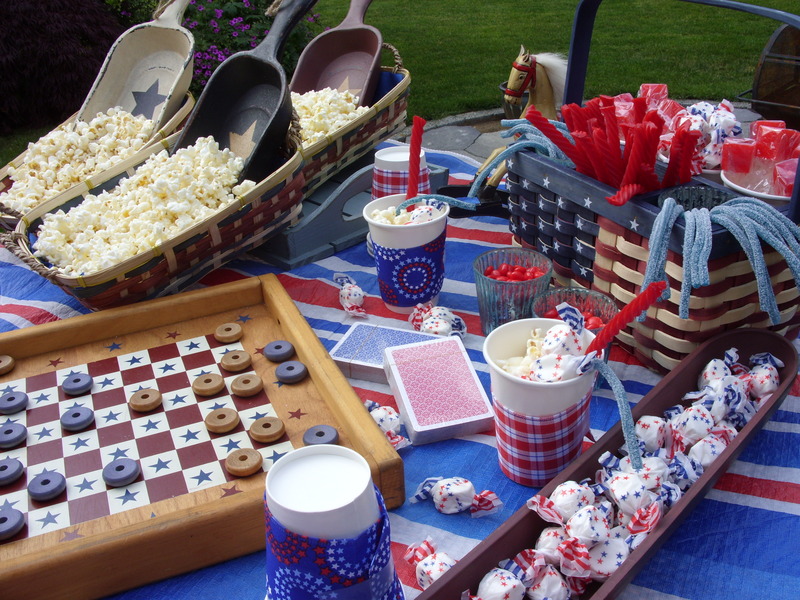 If you are entertaining this red, white and blue holiday, chances are it involves some sort of barbecue – hamburgers? hotdogs? Maybe some ribs? Mmmm! But while you’re greeting your guests, and the meat’s on the grill, remember that people always arrive hungry so be sure to put out a little something for everyone to nibble on. I find that I turn fairly frequently to the old standby. The cheese platter. A little fruit. Some bread. And, of course, a nice variety of cheeses, and voila! Appetizers made easy! 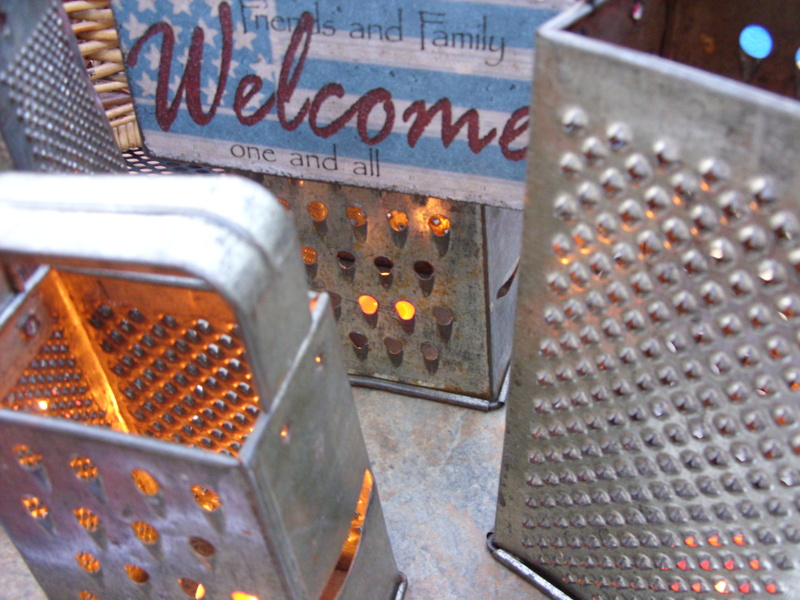 Instead of just laying it all out haphazardly on a platter, why not make it a bit more visually exciting by re-purposing some vintage items and things you may have around the house? 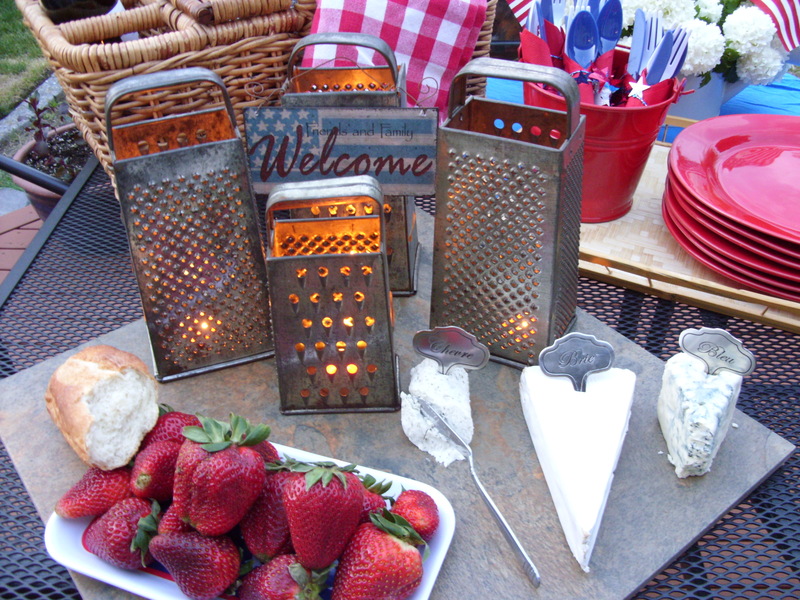 This patriotic table setting was inspired by a recent trip to the flea market and finding these vintage cheese graters for a dollar apiece – just days after pinning this photo of cheese grater luminaries on Pinterest! I could not believe my good fortune! The tile I used for the cheese platter was a tongue-in-cheek gift from my husband on our last anniversary – our 18th – an 18″x18″ ceramic tile. (Ceramic is the traditional gift for year eighteen) and can be purchased at any big box home improvement center for just a few dollars – a far better deal than those expensive cheese slates you see at many upscale home decor stores! He thought I was joking when I told him I would find a use for this someday! 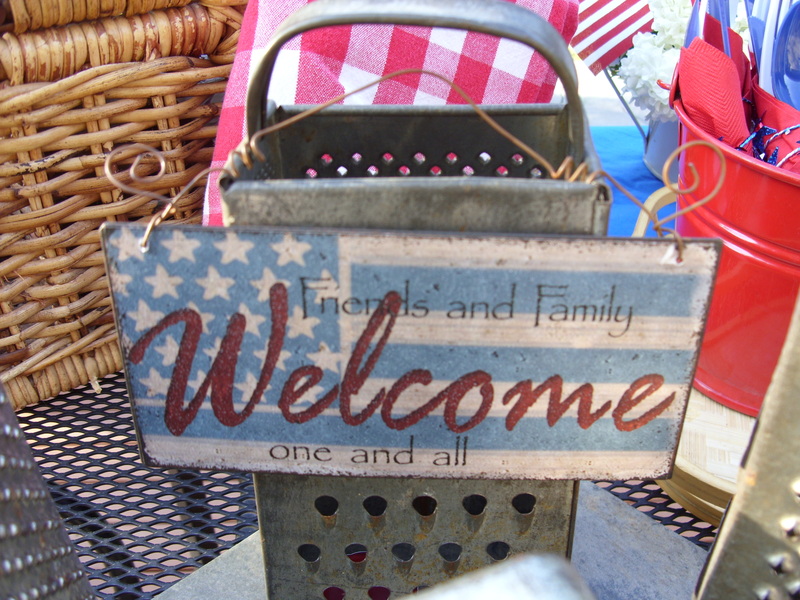 …filled with wonderful food, sunshine and the good company of friends and family! Over the long weekend as you find some time, don’t forget to vote for me for the Circle of Moms Top Mom Party Planner Blogs! You can vote once a day – and that’s great because you have 3 days before I remind you again! 😉 Please go here to cast your vote! Thank you! 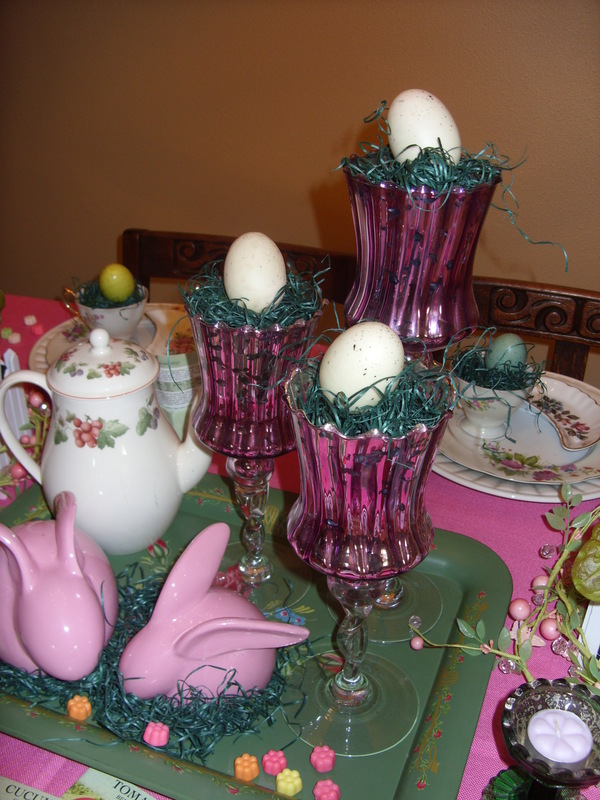 I love Easter because (even if it’s still wintery-like here in the NW!) it signals the true beginning of Spring. The pastel color palette is a foreshadowing to me of the warmer days ahead and the flowers that will soon be blooming all over. 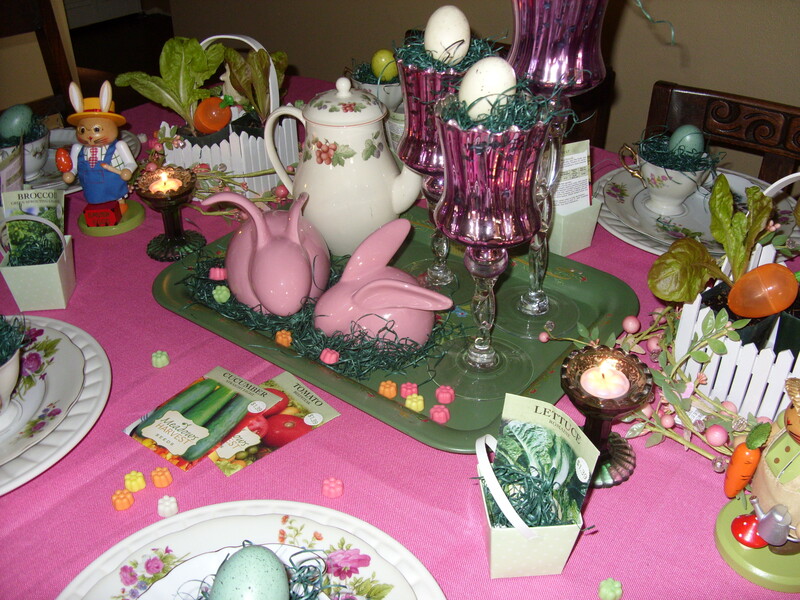 Today’s Easter table-scape is inspired by one of my favorite children’s books – Peter Rabbit. 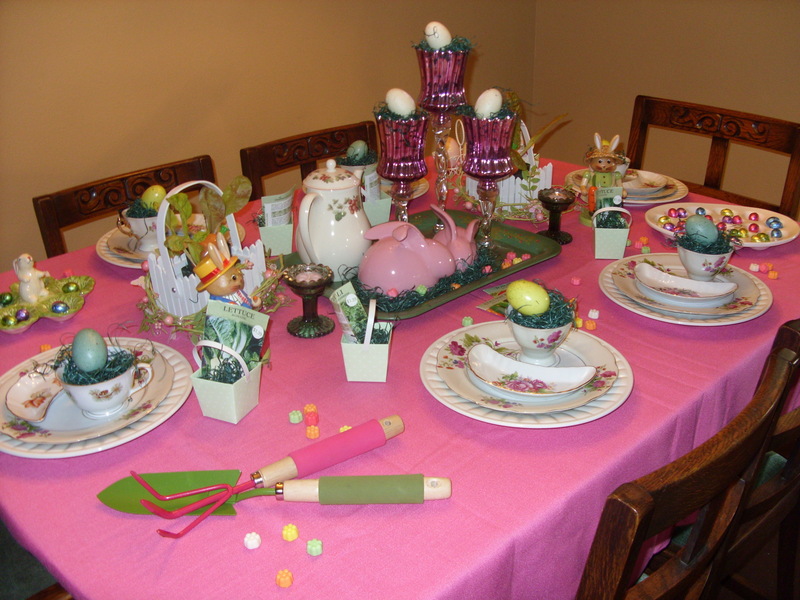 I used a primarily pink and green color scheme but sprinkled in all the other wonderful spring colors with the use of eggs and candy. I just happened to have these little lettuce starts sitting idly by in my kitchen waiting for warmer weather to go in the yard. 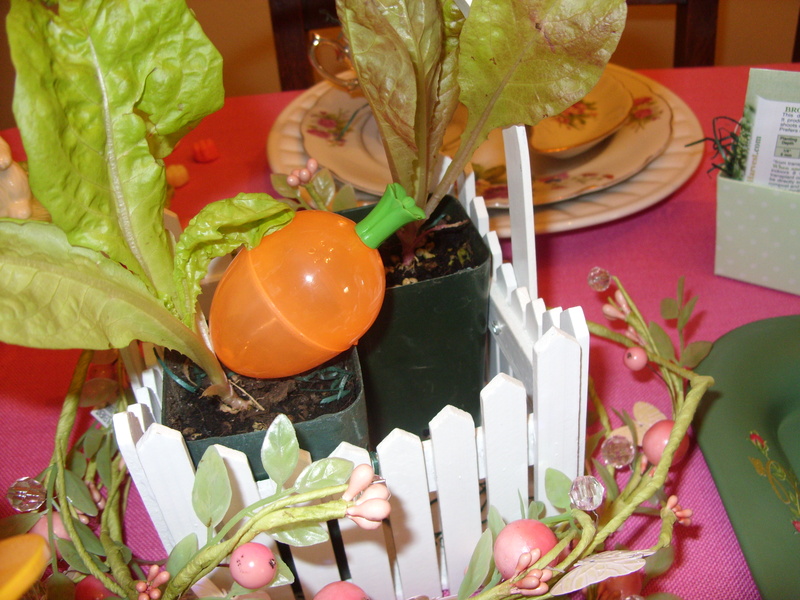 To represent Mr. McGregor’s off-limits garden, I placed the tiny plants in these adorable picket-fence baskets I have. I don’t know where these came from – I’ve had them for years! 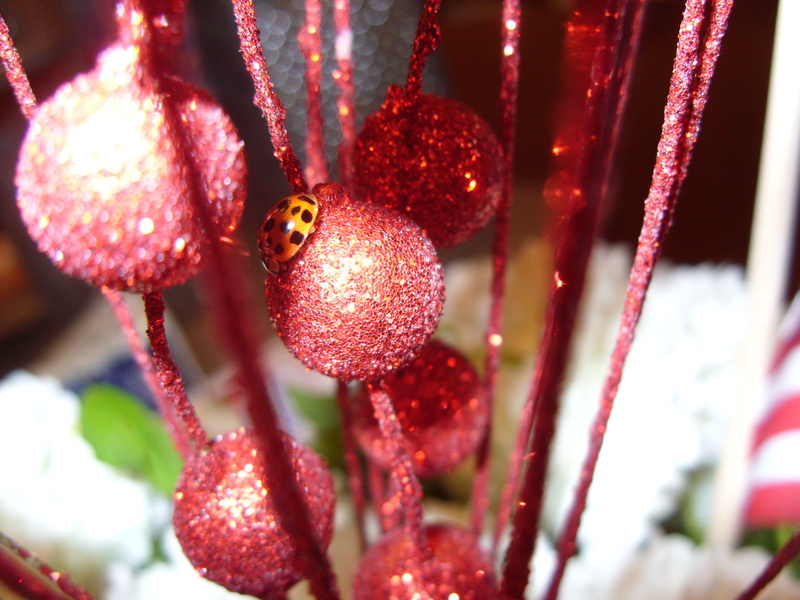 But they sure came in handy in decorating this table! Seed packets add to the theme, but also make a nice favor for each of the children to take home and plant in their own garden – maybe after seeing how much Peter loves garden-delights, they will be inspired to eat more veggies! 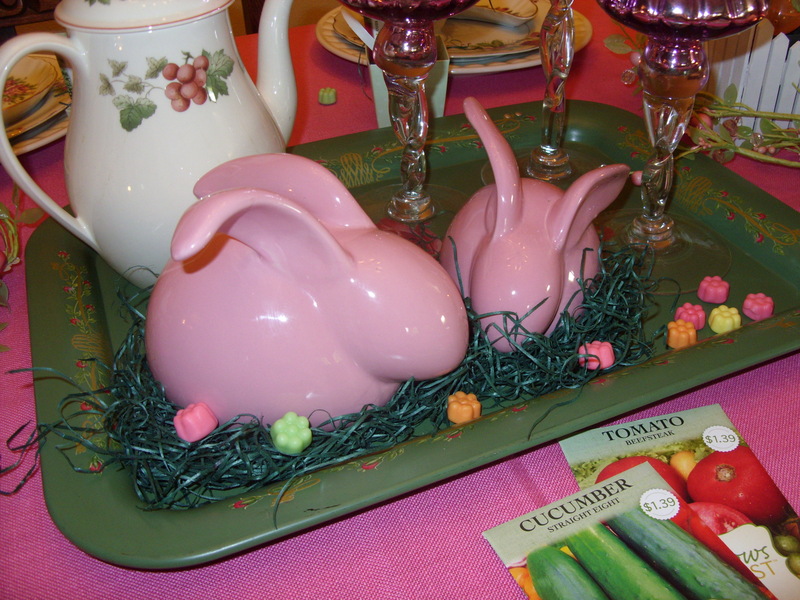 Pair the seeds to take home with some little containers for filling up with Easter candy that they find on their hunt. We will be coloring eggs for him to hide! Of course, I always make deviled eggs from the leftover hard boiled eggs. Mine are made very simply with mayo, a dash of dried mustard and a splash of sweet pickle juice, topped with paprika. 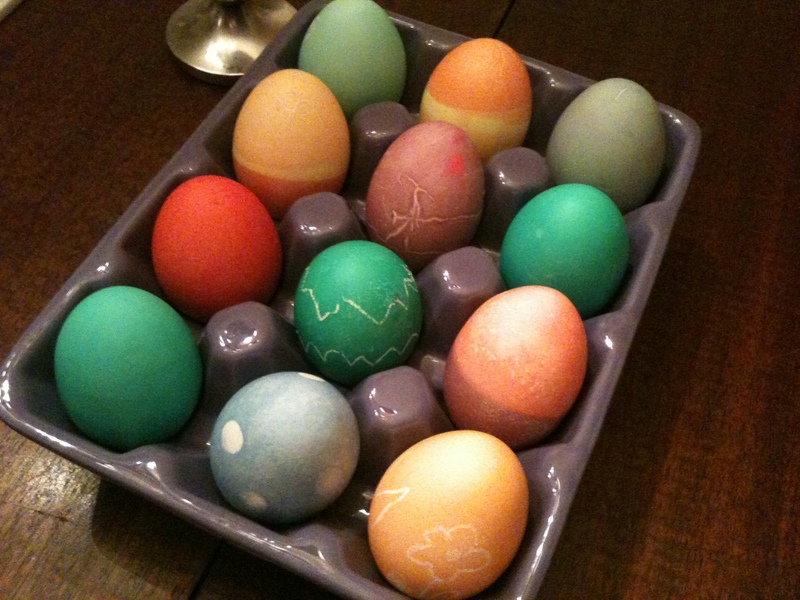 I know everyone makes them different – in some families there even are battles as to who makes the best eggs! 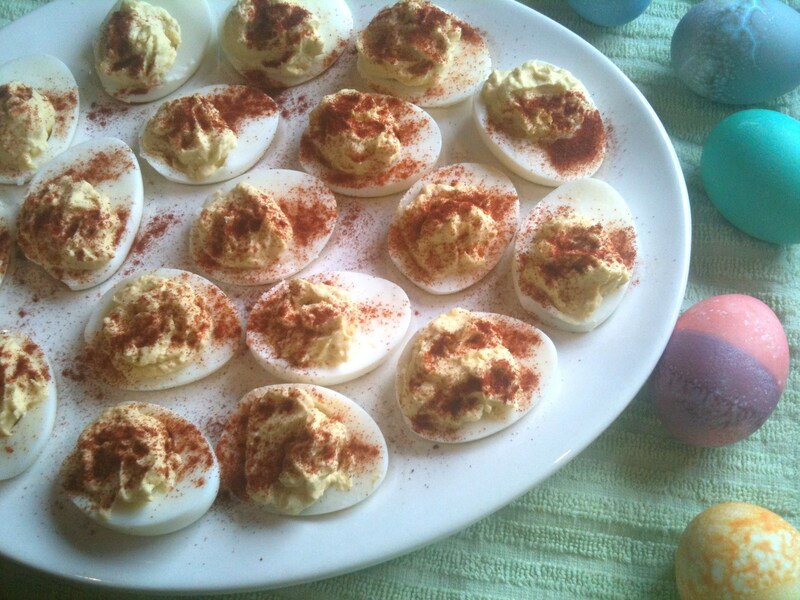 What do you put in your deviled eggs? 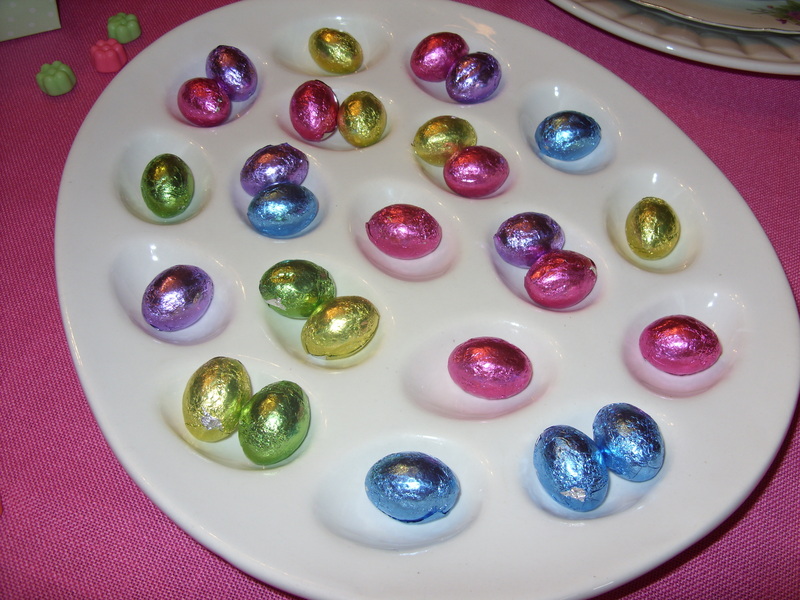 Or do you use your leftover eggs for other things? Egg salad? Potato salad? Something different? Let me know – I’m sure we will have plenty to try something new!